When we think of Japan we tend to think of ultra modern cities, great food and super-fast transport. However the countryside in Japan is just as spectacular. After spending 10 days crazy days in Tokyo we decided to head out to the country side and we looking for the best place to view mt Fuji. 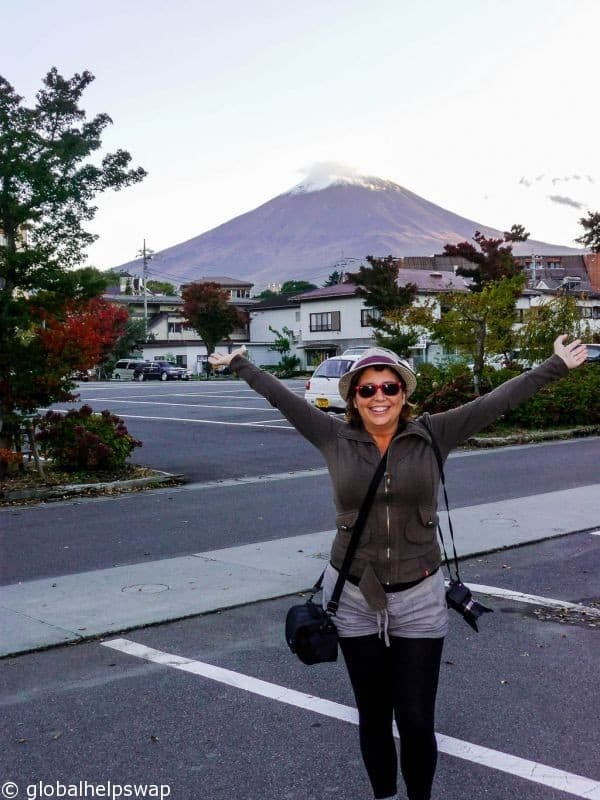 We finally chose our destination and headed from Tokyo to Kawaguchiko to take a trip to Mount Fuji. We weren’t planning on climbing Mount Fuji but we wanted a place that would give us some amazing views of this world famous Mountain. Kawaguchiko would not disappoint. 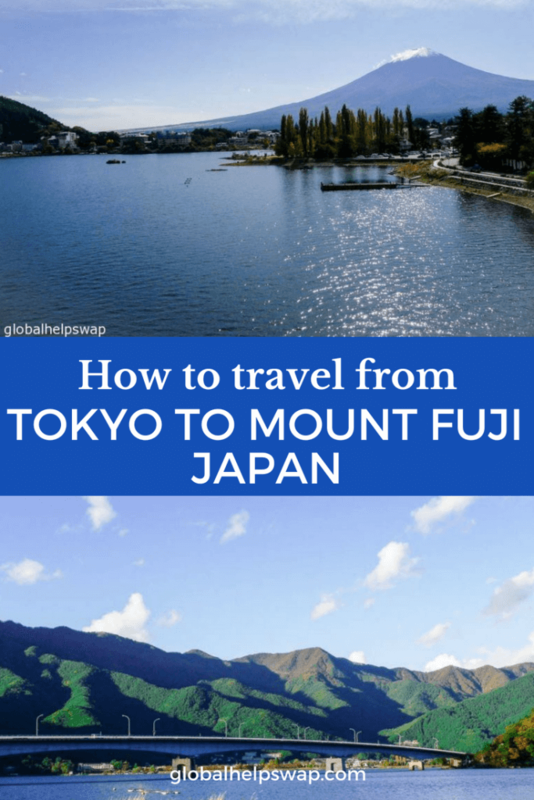 Read on to find out how to get to Mount Fuji from Tokyo, and how to make the most of your trip in Kawaguchiko. 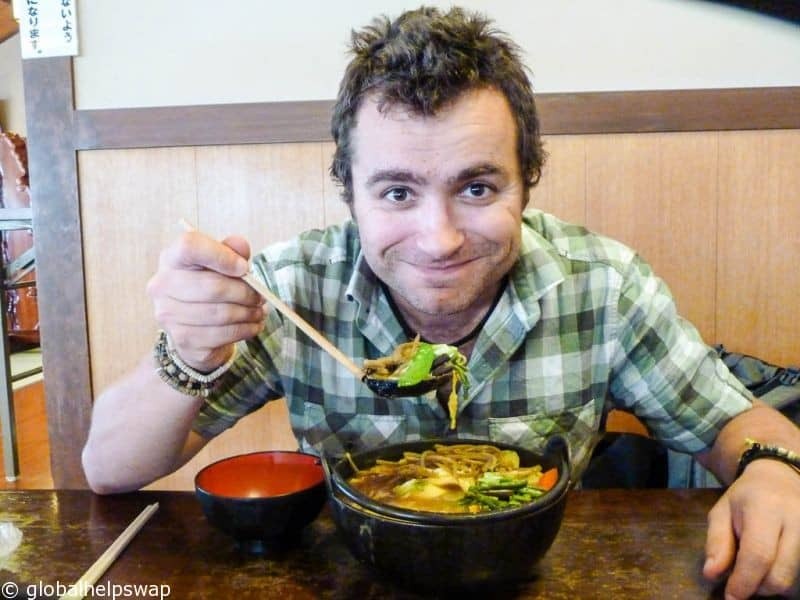 There are a number of different options to get from Tokyo to Kawaguchiko depending on how much time you have, what your budget is and whether you have a Japanese Rail pass or not (something we highly recommend for your trip to Japan). The fastest option is to take the bullet train. Keep in mind there is no direct Tokyo to Mt fuji bullet train so this option requires a number of changes. The bullet train to Kawaguchiko departs from Shinjuku Station in Tokyo. If you have a Japanese rail pass you should be able to get to Shinjuku for free if you use the JR Yamanote line or JR Chuo Line. To get from Shinjuku Station to Kawaguchiko Station you will need to change at Otsuku Station. So when you are at Shinjuku Station head to PLATFORM 10 – this is where trains heading towards Matsumoto and Kofu depart from. Most of the trains heading to either Matsumoto or Kofu will stop at Otsuku Station where you will need to disembark. There are 3 types of trains that will be heading to Matsumoto – Kaiji (slowest of the 3) Asuza and Super Asuza (fastest of the 3). While all Kaiji trains to Matsumoto or Kofu will stop in Otsuku, some Asuza and Super Asuza trains won’t so make sure that the train you are getting does stop in Otsuku. Trains depart regularly and the journey should take around an hour and is free for Japanese rail pass holders. To get from Otsuki to Kawaguchiko Station you will need to purchase a ticket for the Fujikyu Railway Service, even if you have a Japanese Rail Pass so make sure you have some Yen handy. Tickets cost 1140 Yen for the normal train which takes 1 hour to get from Otsuki to Kawaguchiko, or 1440 if you are taking the faster train which will take 45 minutes. This is the Option we took to get from Tokyo to Kawaguchiko and I can still remember the excitement I felt when we first saw Mount Fuji from the train. As we got closer to Kawaguchiko station we knew we were going to be in for a great weekend. From our train carriage we had crystal clear views of Mount Fuji. Sometimes when you visit a place for the first time you get a sense that you have been there before. It’s normally because you have seen so many images or film clips of that particular place that you have a sense of familiarity. That’s what I felt when I saw Mount Fuji for the first time. 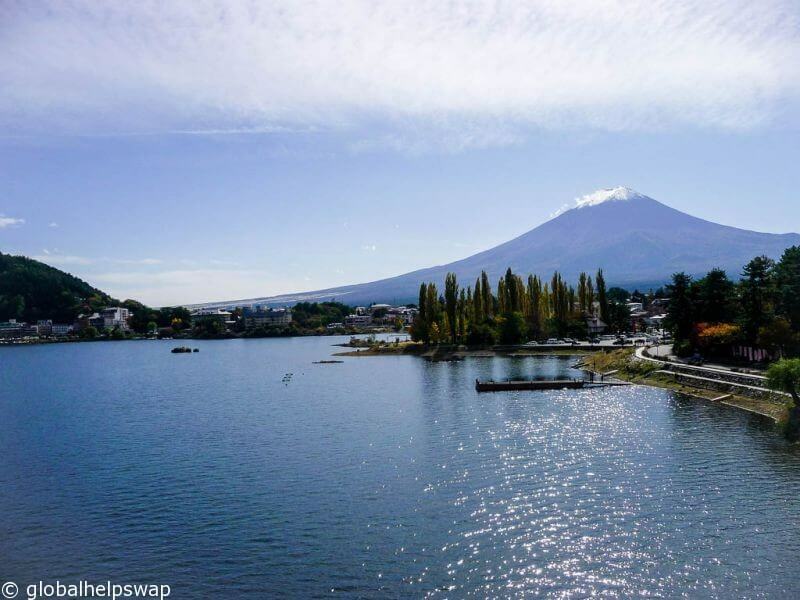 Once you get to Kawaguchiko you can walk to the north shore of Lake Kawaguchi or take the kawaguchiko sightseeing bus, also known as the retro bus to get the best view of Mount Fuji. If you fancy a direct route from Tokyo to Kawaguchiko another option would be to take the bus from Shinjuku to Kawaguchiko. Fujikyu and Keio Bus operate one to two direct buses per hour between the Shinjuku Expressway Bus Terminal in Tokyo and Kawaguchiko Station The one way journey takes just under two hours and costs 1750 yen. 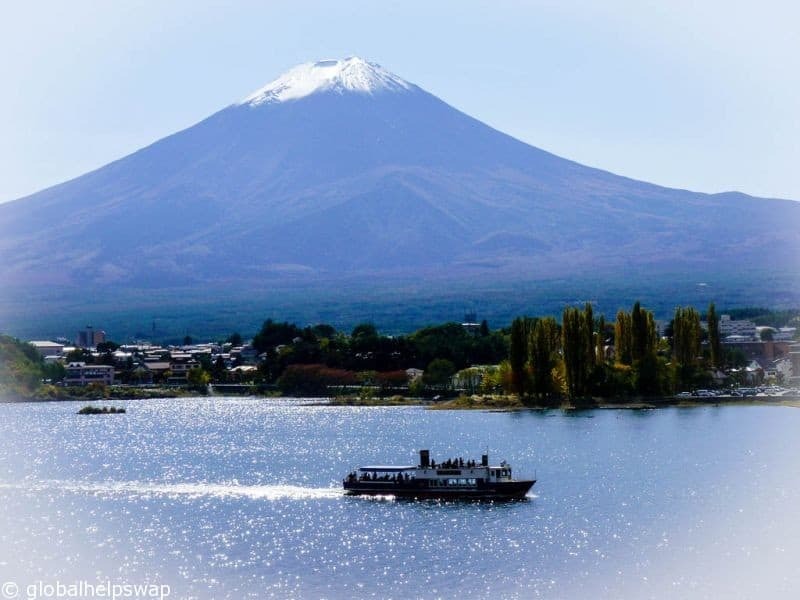 If you are short on time and want to join an organised trip to Mount Fuji, we would recommend joining this tour to Mount Fuji. 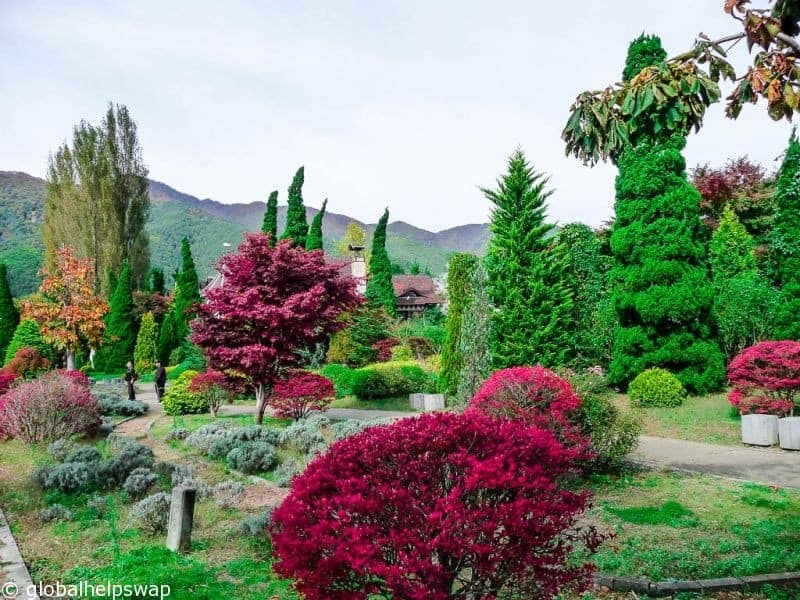 The tour includes a trip to 5th station which is only accessible in the summer, a traditional hotpot lunch, a visit to Lake Kawaguchi, a trip to a Japanese farm for fruit picking and a visit to a winery. We haven’t done this tour ourselves but it has great reviews. Find out more about the tour here. Mount Fuji has been referred to by various names both in English and Japanese. In English you might hear it called “Fuji-San” or “Fujiyama”. While other Japanese names for Mount Fuji include Fuji-no-Yama (ふじの山, “the Mountain of Fuji”), Fuji-no-Takane (ふじの高嶺, “the High Peak of Fuji”), Fuyō-hō (芙蓉峰, “the Lotus Peak”), and Fugaku (富岳／富嶽), created by combining the first character of 富士, Fuji, and 岳, mountain. Most of the Japanese names are obsolete and rarely used, but useful to keep in mind to avoid confusion. The best months to view Mount Fuji are between February and October when the weather is colder. Since early in the morning is colder, it’s the best time of the day to view Mt Fuji. With this knowledge in mind we decided to spend a night in Kawaguchiko to increase our chances to see Mount Fuji through the fog. Kawaguchiko is a beautiful little town. 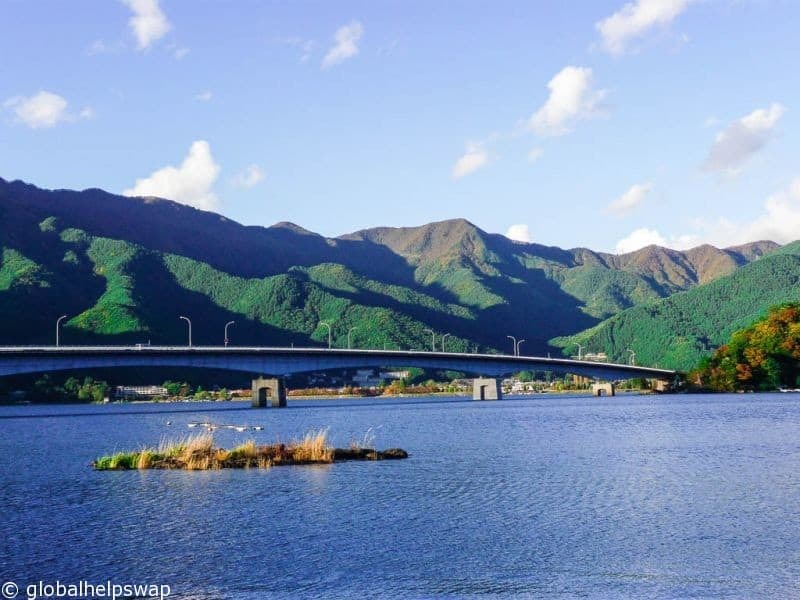 It sits on a large lake, Lake Kawaguchi and has plenty of your Japanese modern amenities that you come to expect. During our visit all the leaves of the trees were showing off their autumnal colours, giving it the feel of New England. 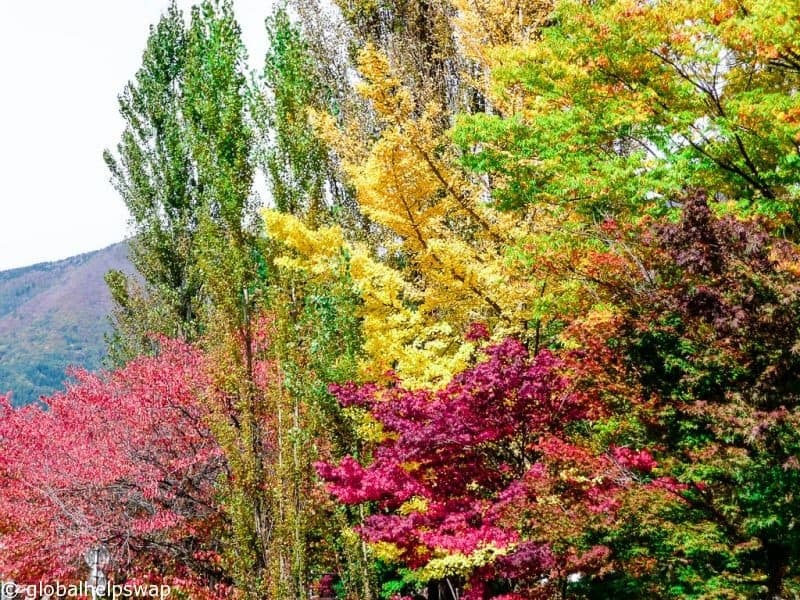 Japan is rightly famous for its cherry blossom season but the fall season gives it a close run for its money in my view. 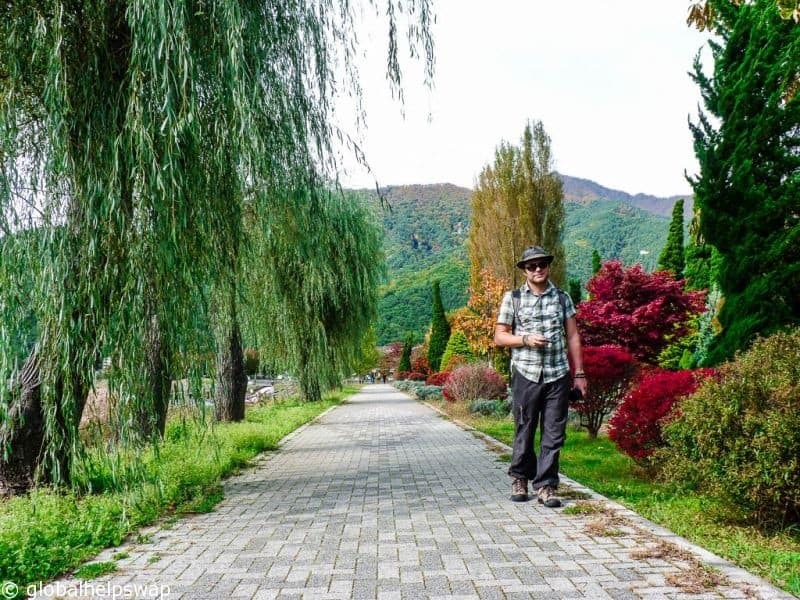 We spent most of our time wandering around admiring the beautiful nature surrounding us. When we were not taking millions of photos of Mount Fuji, we were taking millions of photos of the wonderful Japanese gardens and countryside. We would just wander around aimlessly seeing where we would end up. I love doing that in new places, you really get to discover hidden gems. You can also hire a boat and paddle down the lake. Or for a closer view of Mount Fuji you could take a trip on the Tenjo Yama Park ropeway. This is a cable car that climbs the side of Mt Kchi Kachi and is the best way to see Mt fuji as well as spectacular views of Lake Kawaguchi. Kawaguchiko food is pretty impressive much like most food we ate in Japan but we can safely say we had the world’s best Pork Tonkatsu in this little town at a restaurant called Restaurant Konami. 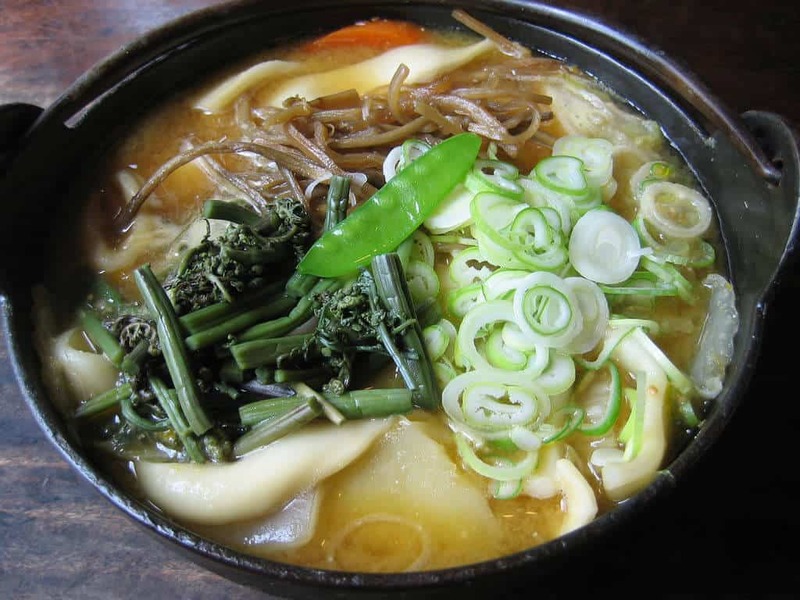 Kawaguchiko is also famous for its Houtou which is a hotpot dish with a miso based broth, thick noodles and served in a huge pot. You will find it in most restaurants in the Fuji Five Lakes region. 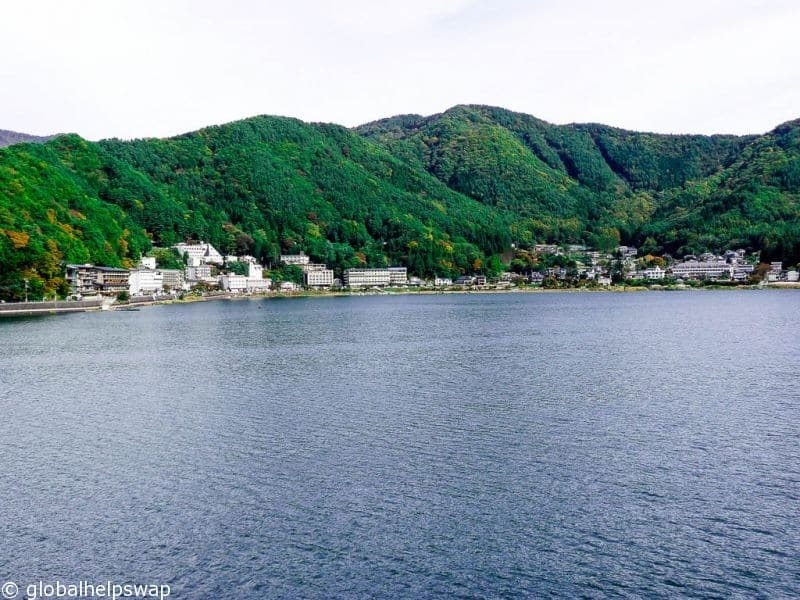 A great value Ryokan that’s 3.4 km away from Lake Kawaguchi. This is a traditional ryokan serving Asian breakfast and has a public onsen available. For latest prices and availability click here. This is a super clean hostel with great amenities and as the name suggests, views of Mt. Fuji. For latest prices and availability click here. If you are planning a visit to Tokyo, do keep free a couple of days to visit Kawaguchiko and Mount Fuji. It will add a different dimension to your trip. No we just went independently.